NASA's Aqua satellite reveals plumes of smoke drifting across hundreds of miles. camera (NASA) NASA has released satellite images of North Korea, taken on April 25, 2014, showing large fires burning in wooded areas all across the country. 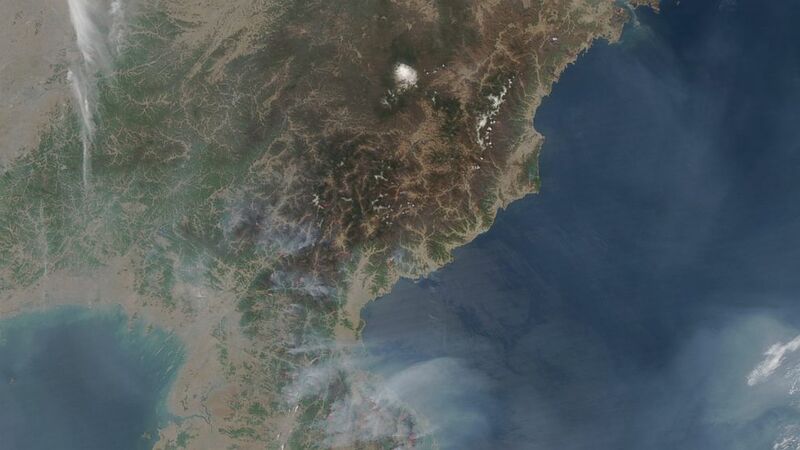 NASA has unveiled remarkable images taken from space of fires burning across multiple regions in North Korea, with plumes of smoke cascading eastward for hundreds of miles. NASA’s Aqua satellite detected dozens of fires and snapped the images on April 25, the space agency said on its website. Click here to see the high-resolution satellite image. Actively burning areas, detected by the satellite's Moderate Resolution Imaging Spectroradiometer, or MODIS, are shown in red. "Many fires appear in farming areas along rivers. While North Korea’s best agricultural land is located on the coastal plain in the western part of the country, many people farm marginal land along rivers in the mountainous areas," NASA's website says. "They use fire to clear debris from last year’s crop and to help fertilize the soil for the coming season. However, some of the fires were burning in heavily forested areas, suggesting that they might be wildfires." Aging power lines are a common cause of wildfires in North Korea, according to a report published in the Asia-Pacific Journal. Fields and grasslands appear light brown in the satellite images, while wooded areas at lower elevations appear green and, at higher elevations, forests are still brown at this time of year. The extent of deforestation stands out in the satellite image -- in stark contrast to the greenery south of the DMZ in South Korea.